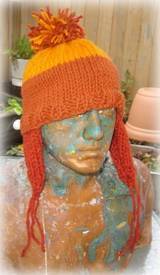 A free knitting pattern to make a hat with beanie styling and ear flaps. red-orange for the ear flaps. I suspect Ma Cobb was the frugal type and merely chose colours from leftover yarn in her stash but if you reallycare about accuracy to the original (a hat worn by Jayne, a character in the short-lived Firefly series), check out the other patterns online for colour suggestions specific to yarn brands. Sew the seam together on the inside of the beanie. Right side: from the seam, count forward about 8 to 10 stitches then pick up 12 stitches using the red-orange yarn. Left side: from the seam, count forward about 8 to 10 stitches then pick up 12 stitches using the red-orange yarn. Slip all stitches on to opposite needle and work as for right ear flap. 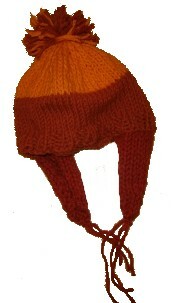 Make a large pompom from all three shades of yarn used and attach to top of hat. In the spirit of the one worn by Jayne, the pompom should not be too full and should be roughly trimmed. Designer Cheryl DeWolfe writes the engaging Flotsam and Jetsam blog.